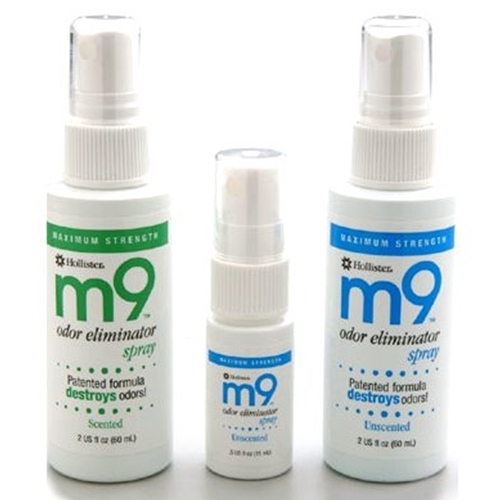 Hollister m9 Odor Eliminator from HealthyKin.com effectively and safely destroys odors, not just masks them. It is available with a pleasant apple scent or unscented. It is conveniently packaged and available with a pump spray or drops. This product does a good job at eliminating odor. I use the unscented so there is no obvious masking odor either. I recommend this product. I don't like the new squared-off opening. It poses a problem with pouring into an ostomy pouch! I liked the more tapered end. I have no baseline to rate this product myself; however, one of the aides here uses and likes the results. I have trust in her judgment about such matters. I bought for her to replace what I had consumed + extra. My co. has been using this product for a number of months now and are totally satified! The is as good as I have used. But I made a mistake. I need the indented not the scented. Other then my mistake this is a great product. How can I exchange this?